The maximum length of a vehicle combination in road traffic will increase from 25.25 to 34.5 metres. The maximum permissible mass remains at 76 tonnes. New type of vehicle combinations that differ from the current standards may also be used on the road. A Government decree on the matter will enter into force on 21 January 2019. 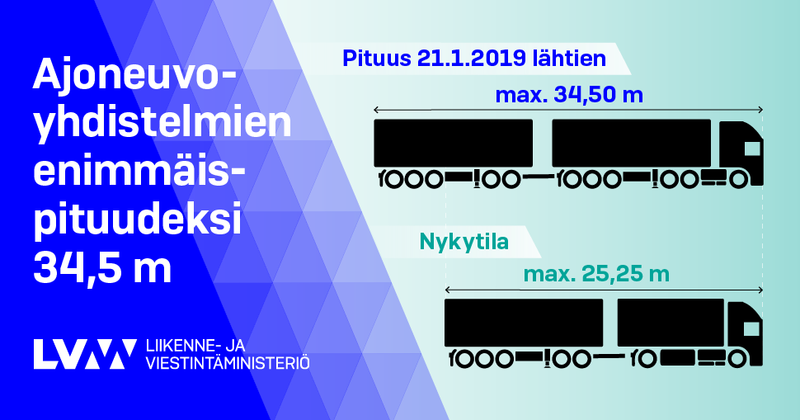 The maximum length of other vehicles than buses and coaches will increase from 12 to 13 metres, the new drawing length of a semi-trailer will be 18 metres and the length of the actual semi-trailer 16 metres. The maximum permissible length of a combined truck and a semi-trailer will go up from 16.5 to 23 metres. The maximum length of a combination of a car and a centre-axle trailer on the road will be 20.75 metres instead of the current 18.75 metres. Before the decree was amended, the so-called HCT trucks, whose lengths and masses differ from what is currently allowed, were tested since 2013. In terms of maximum permissible masses, a preliminary review of the present road network showed that the current maximum permissible mass for a combined vehicle (76 tonnes) cannot be sustainably increased throughout the network. The Transport and Communications Agency, TrafiCom, may also in future grant fixed-term deviation permits for vehicle combinations that exceed the general limit values. The requirements in the decree concerning turnability and stability of long combinations are stricter than what was allowed in the trial. The requirements for combinations also include camera systems for side visibility, an advanced emergency braking and lane detector system, electronic driving stability system and electronically controlled brakes. The requirement of turnability may affect the planning of intersection areas, and the need for restriction signs in the present intersections continues to exist. However, the long combinations do not really need to access different places but they will mainly be used for connections between terminals, larger shopping centres and production plants, and they will mostly be used outside rush hours, like in the night-time. The changes in the lengths of vehicle combinations are estimated to gain significant benefits, especially in transport of sea containers, general cargo and foodstuff. These represent nearly 50% of the cargo transport on roads.